You are here: Home / Music industry & related / Black Conjuration Festival this Saturday! 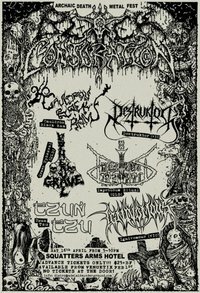 This weekend at the Squatters Arms is Black Conjuration Festival. A metal festival like the town hasn’t seen since the days of Armageddon Adelaide. The Angry Fijian put me to shame by blogging the event (mainly cos he’s excited that he’s going!! haha)… so rather than me put details here, you can just go HERE to see it.